Winter is on it's way. When we lived in Virginia, we didn't ever get too much snow nor temperatures much below freezing for too long a stretch, but now that we're in Maine it's a different story. 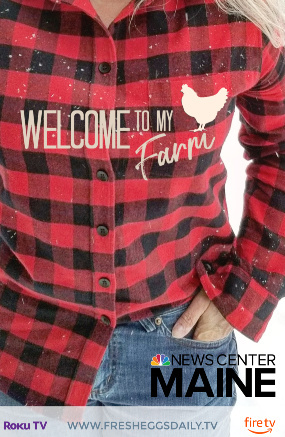 I'm a New Englander born and bred so I know all about nor'easters, blizzards, snow storms, freezing rain, sleet and bitter cold. 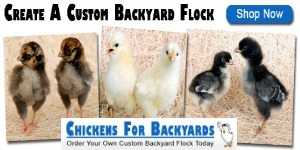 With just a bit of effort you can help your flock better handle the cold. 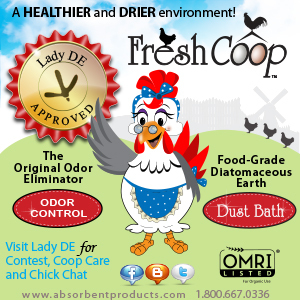 The most important thing in the winter is that your coop is dry and draft-free with good cross air flow and ventilation higher than the roosts. Frostbite is partially caused by damp conditions, so having adequate ventilation not only provides clean fresh air but helps prevent frostbite. 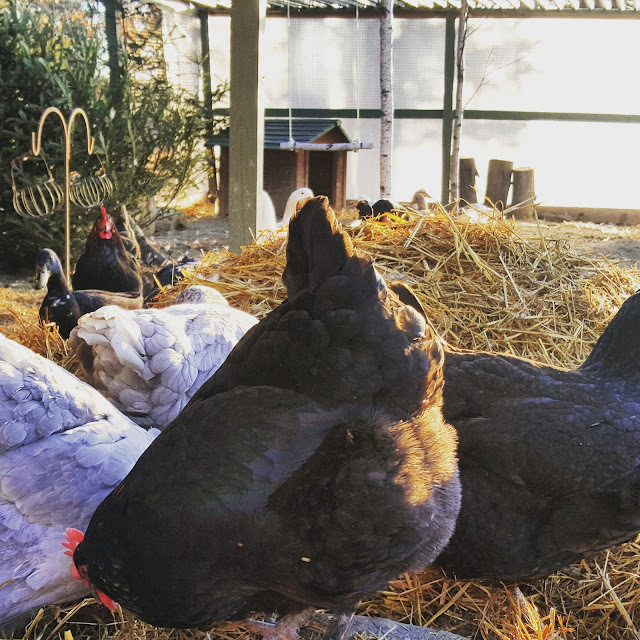 Roosts should be wide enough that your hens' feet are flat when they roost and completely covered by their bodies/feathers from the top and the roost board from underneath. 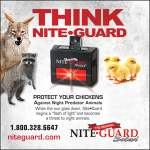 This not only prevents frostbite, but also rats or mice nibbling on the chickens' toes while they sleep (believe me, this can happen). A 2x4 with the 4" side facing up with the corners rounded off a bit is perfect. 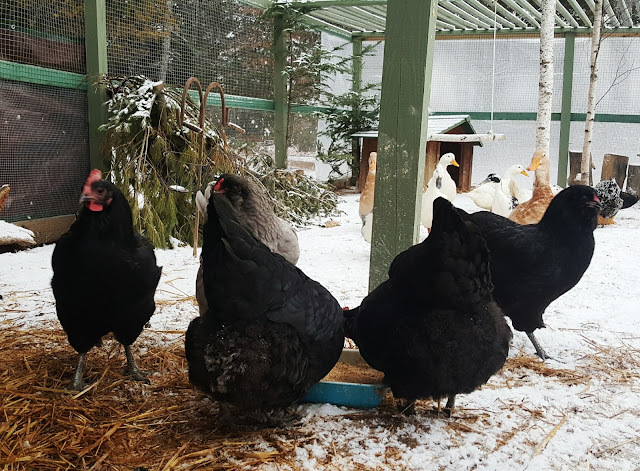 Here are a few more easy things to do to prepare for the approaching cold weather as well as prepare for a blizzard to help keep your flock warm and also to make your life easier. Chickens generally don't like to walk in the snow. They would much rather stay inside than have to walk on a cold surface. I put down straw 'paths' from the coop door to sheltered areas of the run for them in the winter when it snows. I also have set upturned stumps along the edges of the run. We had a few trees fall in the last hurricane that swept through, so the trunks were re-purposed into 'run seating'. I constructed some roosts out of branches in the corners of the run for our chickens to perch on. They love to line up and watch the world go by. The hens, especially those with feathery feet, really like being able to get up off the ground and out of the snow, ice and mud. Free wooden pallets or logs are another great way to get them up off the ground, as are benches or even lawn chairs. Suet is also a great winter treat for your flock. 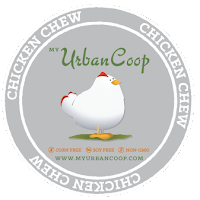 The fat in the suet provides energy for chilly chickens. Save up your meat grease in a small dish, then stir in peanuts, raisins or other grains and seeds and freeze until solid. Warm oats also makes a much-appreciated treat in the winter. Pour some water heated in a teakettle over a pan of old-fashioned oats and mix in some cinnamon, raisins, wheat germ or sunflowers seeds. 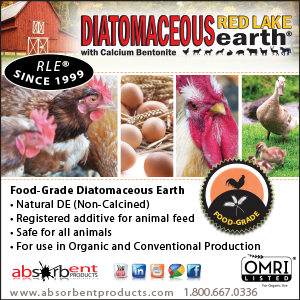 Your chickens will love it! Especially if you live in an area that gets lots of snow and isn't close to town, keep in mind that a deep snow or blizzard might prevent you from being able to get to the feed store, or even prevent delivery trucks from being able to make their deliveries to the feed stores. 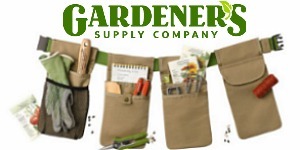 Since the feed will keep in a cool dry place just fine, plan on keeping at least a month's supply on hand. I also keep extra straw on hand to stack in the coop along the walls to provide natural 'insulation'. As the days shorten, laying will slow or stop completely in some instances. 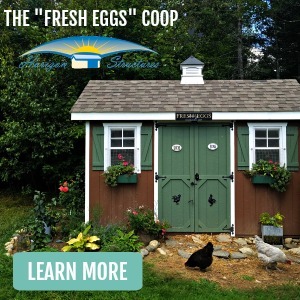 Think about whether you will be adding supplemental lighting in the coop [Read more here about some warnings about adding light to your coop...] to prolong laying through the winter (although not my recommendation). 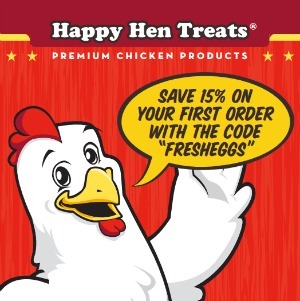 And if you heat your coop, you might want to reconsider that. 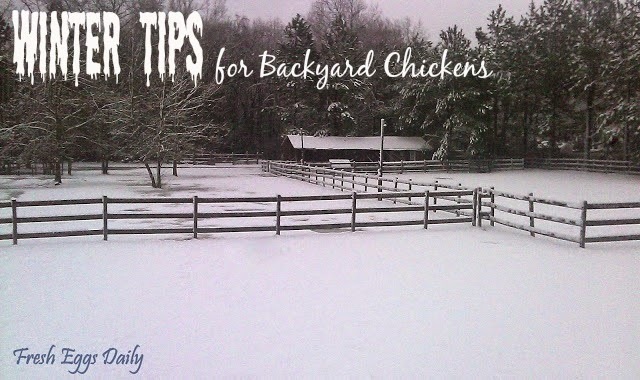 If you have a storm and lose power, your chickens won't be used to the cold and could freeze to death. 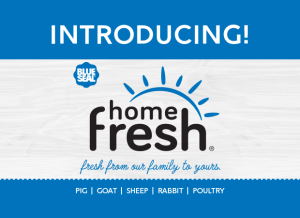 Obviously providing your flock with clean, fresh (unfrozen) water is important. You can buy (or make) a heated base for your metal waterers, but of course they do present a fire hazard of sorts - and I found they won't last all that long and are too expensive to keep buying new ones. We stopped using the metal waterers a few years ago because they rust and they aren't optimal for ducks. Instead, we use deep black rubber tubs for water. Set in the sun in the winter, the black rubber absorbs the heat from the sunlight and seems to keep the water from freezing far better than a metal waterer. Also, the greater surface area and depth both work against freezing. A few ping pong balls floated on the surface of a water tub will also create just enough movement to prevent the tub from freezing. 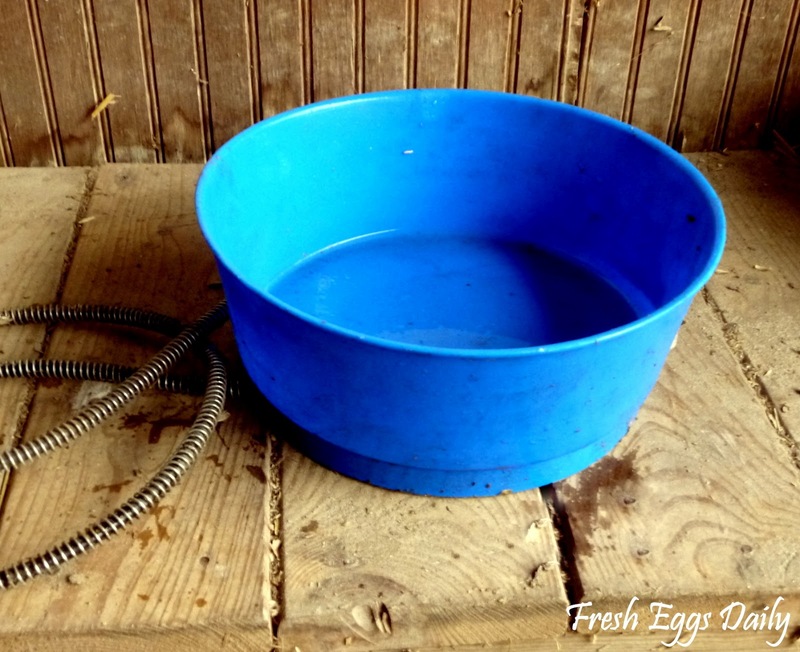 We're lucky to have ducks who play in the water all day long, so that also seems to keep the water from freezing for the most part, but we do use an electric heated dog bowl in the winter. 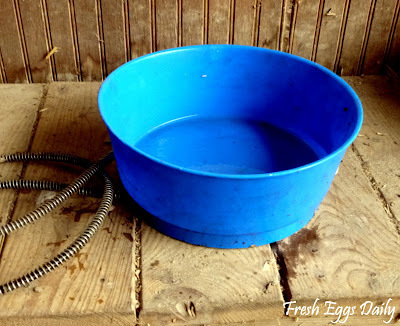 Inexpensive, safe and easy to clean and refill, I find this is the easiest way to keep the water from freezing. Read HERE for more tips on keeping water from freezing. Chickens are actually pretty cold hardy and on all but the most frigid days would rather spend their days outside. Covering part of your run with a tarp, sheets of plywood or plastic can create an area where they can get out of the wind and snow and enjoy some fresh air. We use shade fabric or a clear tarp in the northwest corner of our run to create an L-shaped protected area for our flock in the winter. They really seem to appreciate being able to get outside but out of the wind. But a word of warning about run and coop roofs. Snow is heavy. Be sure to keep the top of your run and your coop roof free of snow so they don't collapse. Even netting-type tops on runs can collapse under the weight of snow that collects on them. I use a broom from underneath to bang the snow off the netting top of our run. 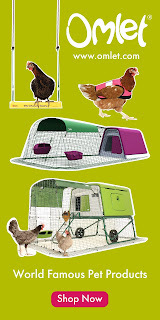 Just making these few simple preparations can ensure the winter will be far more comfortable for your chickens and easier on you. Then you all can relax and enjoy the beauty of the season. 8) Broom and snow shovel! 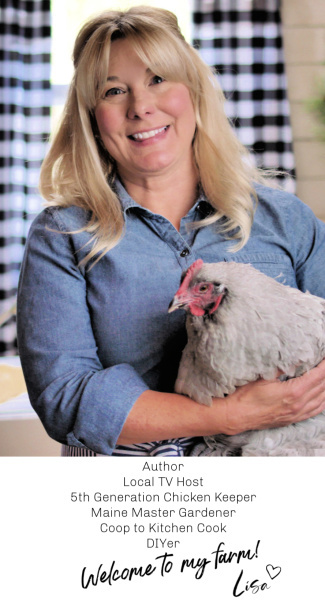 If you like us on Facebook and our blog, you'll LOVE my new book with an entire chapter devoted to caring for your chickens in the winter! 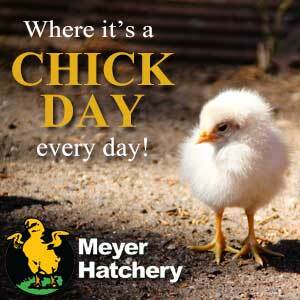 Fresh Eggs Daily: Raising Happy, Healthy Chickens...Naturally! Order your copy ---> HERE! Great info! I tried to click the [Read more here about sprouting seeds...] link, but the link isn't linked :( I think it's a great idea to grow some fresh greens for the birds to eat during the winter! Sorry! The link is up and working now. Bulldogma- soak your beans (I use lentils) in water over night. In the morning drain them and put them in a large wide mouth canning jar. Cover the jar with cheese cloth and secure with a rubber band. Prop at an angle in a sunny window. 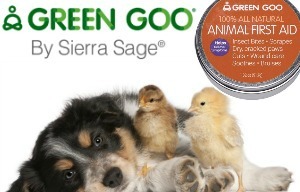 Easy cheap greens for the chickens in the winter. We. Have so many trees. So I rake leaves all winter right into the runs..they have them for warmth and exercise I throw scratch into the leaves they also don't have to walk on a wet cold ground plus there's always bugs in the leaves they love going thru them.....then when spring comes there all composted for the garden. I like your Blog and pics! & I am a new follower from Blog hop! I'm following for GFC, facebook, twitter and youtube. I hope your visit! Welcome! So glad you are joining me on this journey! Thanks so much! Wonderful tips! I won't be getting my ladies until next spring, but I have linked to this post in my new blog so I can refer to it next year! Speaking of chilly chickens, we live in MA and have 4 wk old chicks that will be ready to head out to their coop in a week or two. We've got them at a little under 80 degrees right now (which we will continue to lower weekly), and are worried they'll be cold when they move out. 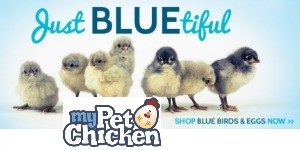 Can you recommend a way to acclimate them once they are in the coop? 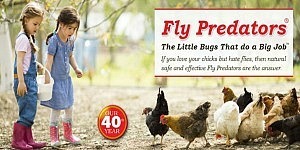 Should we give them a little extra heat for a few days or so in their roost? This week we've got high only on the 50's and getting pretty cold at night. AND when can we start to turn the heat lamp off, or shouldn't we? Hi there. I grew up in Massachusetts! Four week old chicks,MA this time of year - I would keep them inside for longer. Even here in Virginia in the spring I don't put chicks outside until they are about 6 weeks old. Heat lamps are a fire hazard out in a coop of course, not to mention if the bulb were to burn out overnight, they would freeze. 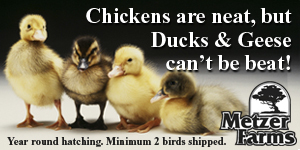 At 6 weeks, they still need to be kept at 65 degrees or so, until they are fully feathered they can't regulate their body temperature. This time of year, I would suggest moving them into a pen in your garage if you can instead and keeping them there, under the heat lamp as long as you can. Technically, they need to be under the lamp until the temperature under it is the same as the outside low. So, as it gets colder, you're lowering the temperature each week, but its probably getting colder faster than you're lowering it. Hope that helps. I find it far easier to raise chicks in the spring since the outside temps are rising as the temp in the brooder is falling, so eventually they meet. This time of year, its the opposite. Great tips! I like the stumps for 'outdoor seating'! I put a small igloo style doghouse in their run with hay in it for outdoor cover. Thanks for linking up! 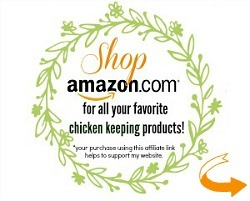 I'm sure my sister will be happy to read your post, she loves her chickens and learning more about how to take better care of them. Tayet was right! Thanks for these wonderful ideas! Thank you for the great info, just in time for the snow! I wound up with only one hen this winter so I moved her into my small greenhouse. I normally have my chickens in 4'x 12' chicken tractors that I move to fresh ground each day. Because it rains so often here in western Washington State the roof is two 2' x 12' sheets of translucent plastic roofing which allows them to forage in the dry. Excellent information! 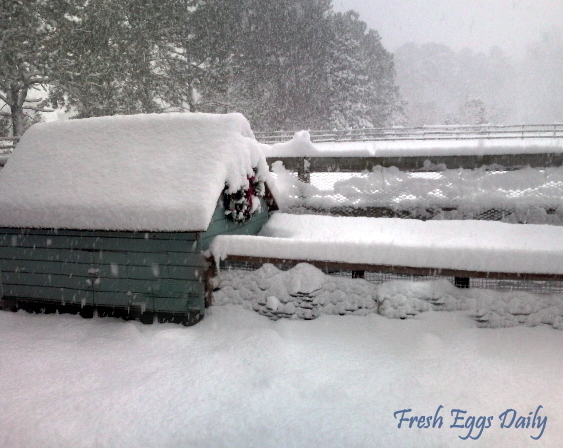 Your chickens are so lucky to live on your farm :) Thanks so much for sharing on the Winter on the HomeAcre Hop!!! Fantastic post. 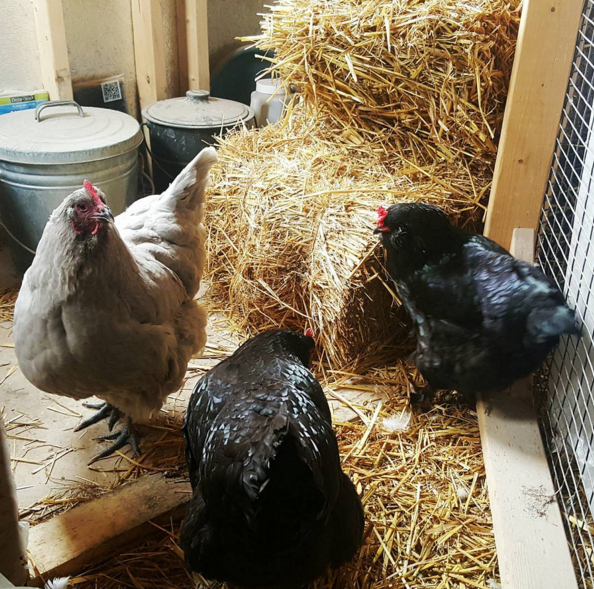 We acquired chickens a month ago and are debating how to winterize the coop as the snow may arrive in a month. 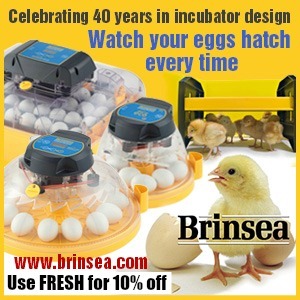 I like the idea of not adding artificial light and freezing excess eggs right now (we almost bought a bulb the other day and had a weird feeling not to!). I put ping pong balls in my rubber tubs with water last year and they kept blowing out or the chickens and ducks would knock them out.